Our season is off to a wonderful start with the acclaimed production of Twelve Angry Jurors presented at Waynesboro Golf and Country Club. We have received so much positive feedback from you, our supporters, about not only what a fantastic production it was, but also how much you enjoyed participating in theatre a unique setting. With your help, we hope to continue providing you with more of these types of options. For 56 years Waynesboro Players has been transporting audiences, inspiring talent, and providing an artistic public service – all without ever paying any staff or performers. We remain a completely volunteer organization! We believe in COMMUNITY theatre being just that – for the whole community. For supporting what we do, we say, “Thank You”, and we ask for your support for another year. Tickets sales account for only a small fraction of our annual expenses. Please consider a year-end, tax-deductible donation. Thank you for 56 entertaining years and we look forward to bringing you magical moments for years to come. 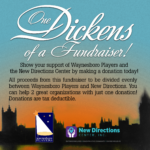 If you wish to donate please go to our website www.waynesboroplayers.org and select the donate link located near the bottom of our web pages. Check out our upcoming production of Oliver!